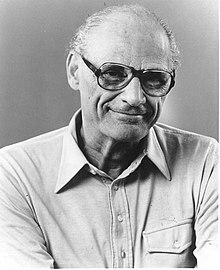 Arthur Asher Miller (17 October 1915 – 10 Februar 2005) wis a proleefic American playwricht, essayist, an prominent figur in twentiet-century American theatre. Amang his maist popular plays are All My Sons (1947), Death of a Salesman (1949), The Crucible (1953) an A View from the Bridge (1955, revised 1956). He wrote several screenplays an wis maist notit for his wark on The Misfits (1961). The drama Death of a Salesman haes been nummered on the short leet o finest American plays in the 20t century alangside Eugene O'Neill's Long Day's Journey into Night an Tennessee Williams's A Streetcar Named Desire. Miller wis eften in the public ee, particularly in the late 1940s, 1950s an early 1960s. In this time, he wis awairdit a Pulitzer Prize for Drama; testifee'd afore the Hoose Un-American Acteevities Committee; an wis mairied tae Marilyn Monroe. In 1980, Miller received the St. Louis Literary Awaird frae the Saint Louis Varsity Library Associates. He received the Prince o Asturias Awaird, the Praemium Imperiale prize in 2002 an the Jerusalem Prize in 2003, as weel as the Dorothy an Lillian Gish Lifetime Achievement Awaird. ↑ Çakırtaş, Önder. "Double Portrayed: Tituba, Racism and Politics." International Journal of Language Academy. Volume 1/1 Winter 2013, pp. 13–22. ↑ Saint Louis University Library Associates. "Recipients of the Saint Louis Literary Award". Archived frae the oreeginal on July 31, 2016. Retrieved July 25, 2016. This page wis last eeditit on 10 Dizember 2018, at 07:19.